I can’t remember if I told you guys about my car troubles in November and December… but in addition to being in a hit-and-run accident and getting a flat tire within 36 hours in November, I also managed to get two flats within 24 hours in December right before heading home to Austin for the holidays. And when I got my car back and drove it to Austin, I ended up having to get another tire replaced due to a giant bubble I got on the ride down! Crazy. Needless to say, I was not happy about any of those events – especially the week of the three tire replacement mess. Right before I went home for Christmas, I had lunch with my friend Amy at Forty Five Ten – since I didn’t have my car back yet, I obviously ubered there. Upon entering I discovered quite an amazing sale going on throughout the entire store. That’s where I found this precious little pink bag by J.W. Anderson! It was over half off the original price and just the ticket to turning my mood (and luck!) around. I decided right then and there to treat myself! Pink is one of the biggest color trends for spring, so I feel like it was a solid investment in my warm weather wardrobe. Naturally, I couldn’t wait until spring to wear it. 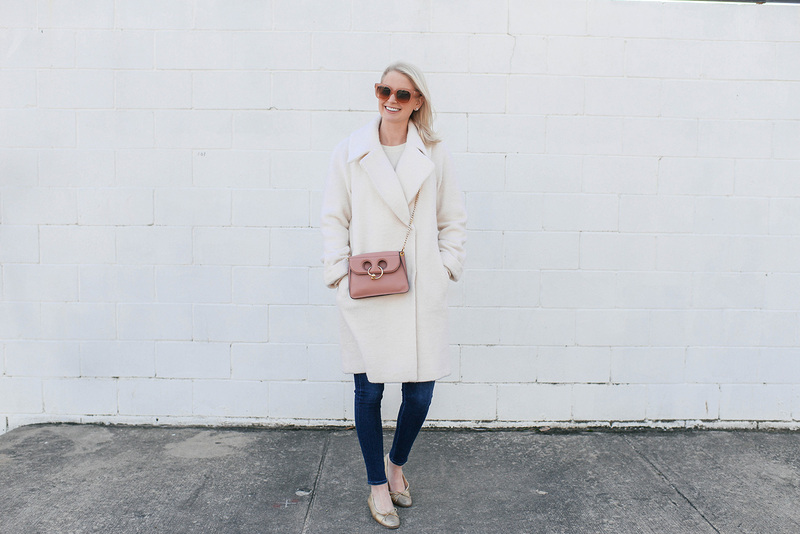 It looks gorgeous with white, camel and other soft neutrals in my winter wardrobe! Obsessed. 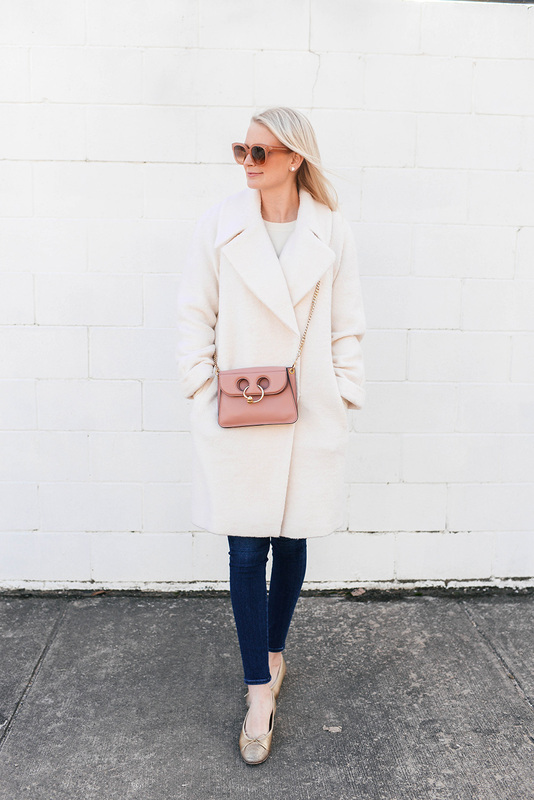 If you’re on the hunt for a mini bag like this (also a big Spring 2018 trend! ), here are some others I’m eyeing – so many darling pieces! Love this color but want to try a different style? 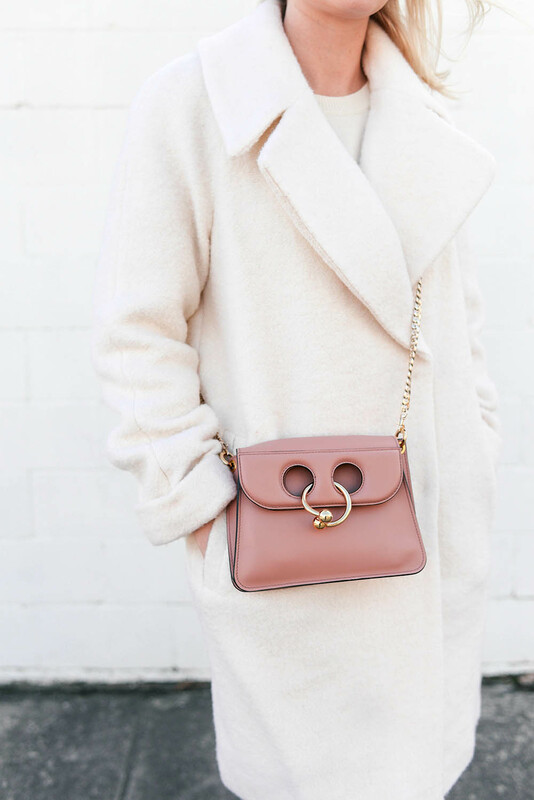 Check out this cutie by Mansur Gavriel. This little bamboo bag is so ladylike and fun – love a good shape like this! Don’t forget your mini bag for the beach! So adorable. I love the shape and braided handle of this under $300 piece! If you’re looking for a neutral, don’t miss this mini Prada tote. Too cute! I told y’all pink was in for spring! Try the trend with this bag, this bag or this bag. Meghan Markle recently wore this bag to a royal event! 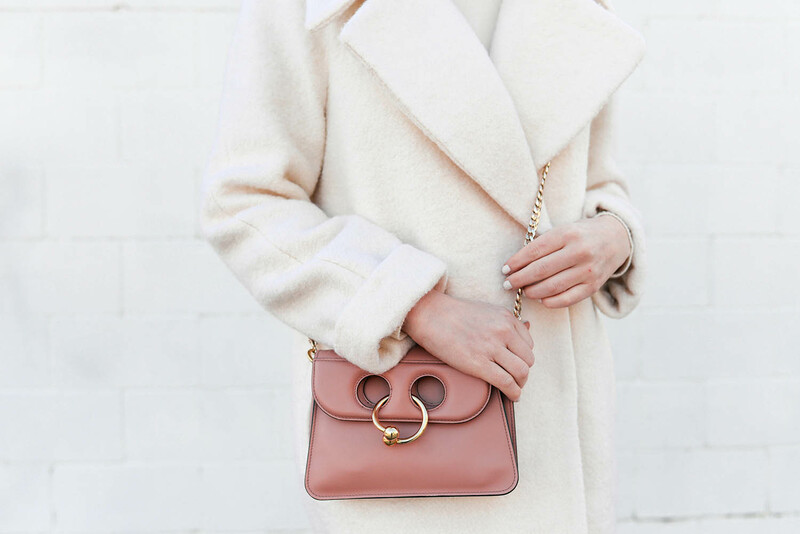 Loving the delicate chain on this Gucci Marmont crossbody. that little bag is the cutest. It’s a Snow Day here in North Carolina! As I was sitting on my couch with my little ones who are off of school today, I opened today’s post. While I was admiring your gorgeous bag, my son looks over at my phone and said,”Is that a Mickey Mouse purse?” Ha! When I looked at the purse again, I noticed the Mickey head shape he was talking about! Too funny! Thought I’d share to bring a little smile to your face this morning! 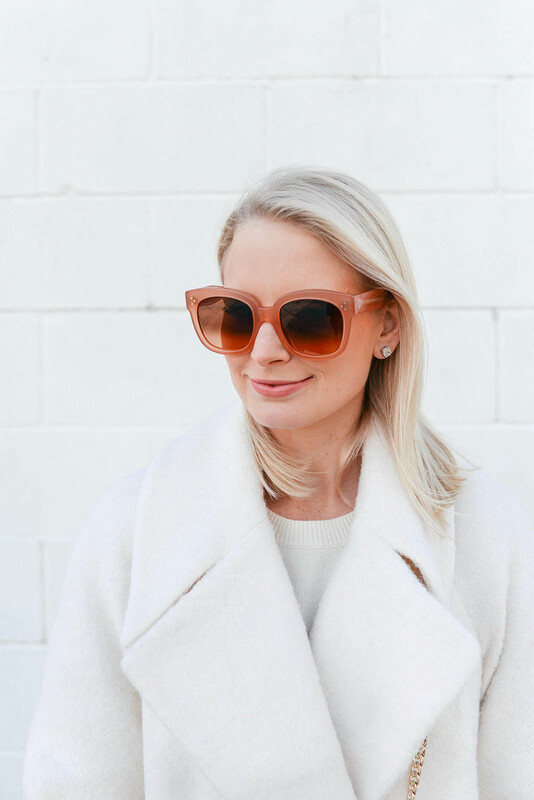 Love this look on you, Merritt! Perfectly styled as always! 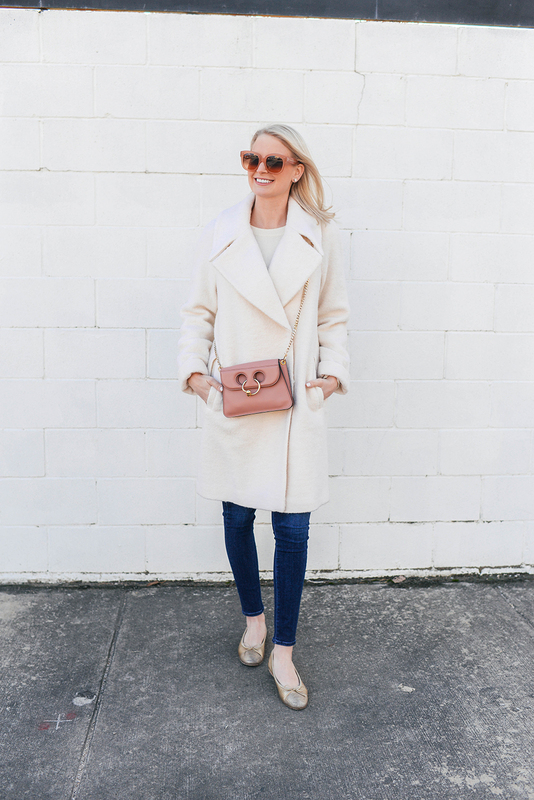 What a cute white coat!